Sometimes, as the old saying goes, you get caught with your britches down. In 1964 and 1965, during his spring hiatus from shooting the TV series RAWHIDE, a young Clint Eastwood went to Italy and shot a couple of westerns for director Sergio Leone. He even wore his same RAWHIDE boots in both features. The two features, PER UN PUGNO DI DOLLARI and PER QUALCHE DOLLARO IN PIY, were immediate smash hits in Europe. Although not the first of what is now known as "spaghetti westerns," they certainly helped put the genre on the movie map. The two films would eventually be released in the U.S. in 1967 as FISTFUL OF DOLLARS and FOR A FEW DOLLARS MORE. But as is always the case, soon the "pasta pictures" were being made overseas by nearly everyone. One such director was Enzo Barboni. In 1970, he made two westerns featuring Mario Girotti and Carlo Pedersoli. Two years later, AVCO-EMBASSY acquired the U.S. distribution rights to the two features. For American audiences, Girotti and Pedersoli became Terence Hill and Bud Spencer, and the films were released as THEY CALL ME TRINITY and TRINITY IS STILL MY NAME. Salisbury had its first opportunity to see THEY CALL ME TRINITY at the TERRACE THEATRE, but locals did not respond. There were probably more crickets in the auditorium than patrons. TRINITY IS STILL MY NAME didn't even get a first-run engagement as a single. So the films were quickly forgotten until a year and a half later when they re-appeared as a double feature, this time at the slumping downtown CAPITOL THEATRE. When the staff reported to work that Friday evening, there was a line from the theatre box office down Innes Street around the Salisbury Post onto Church Street. And it was a very cold January night. The CAPITOL filled up quickly that night, as well as all day on Saturday and Sunday. The receipts were so good that week that the cowboy combo went straight to the THUNDERBIRD DRIVE-IN THEATRE the very next weekend, and even in February, the TRINITY films did great business. Memorial Day weekend soon rolled around, and with no strong movie to book for the CAPITOL, the TRINITYs were brought back to sort of fill in a slack week. The lines were back down Innes Street again. 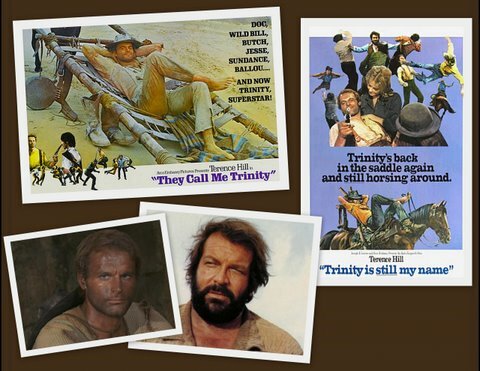 I never did figure out the TRINITY craze.